Old Shivnath was the head of the Sharma family, a position that brought to him more problems than peace. It was a large joint family. Grown-ups sons, their wives and children. Also a grand daughter, Krishna, who had lost her parents in a fatal motor accident. Yet this was a house divided against itself; suffering at all times from discord and disharmony.Old Shivnath was the head of the Sharma family, a position that brought to him more problems than peace. It was a large joint family. Grown-ups sons, their wives and children. Also a grand daughter, Krishna, who had lost her parents in a fatal motor accident. Yet this was a house divided against itself; suffering at all times from discord and disharmony. When everything seemed to have reached the breaking point, Shivnath watched with dismay and helplessness as he feared that his house, his familyall would just collapse like a pack of cards. When everything seemed to have been lost, there came a man. A cook, but no ordinary Bawarchi this, though the dishes he served were never less than delicious. In fact, his extraordinary capabilities made the family look at him with suspicion. They could not help wondering how a mere cook could sing, dance, write and recite poems, be adept at even the most advanced mathematics ready to solve great engineering problems, and even prescribe medicine to the ill. Why, they wondered, should such a man take unemployment as a cook These suspicions quickly disappeared. 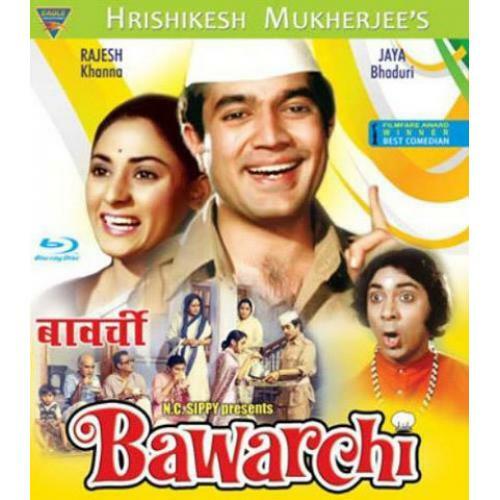 It took the Bawarchi very little time to win over the entire family with his deep and sympathetic understanding of every problem, and his endearing love for everyone. Under his stewardship, the unhappy house was transformed into an earthy Paradise, where nothing could go wrong. The Bawarchi had performed a miracle, no more, no less. Then, one fine morning, every valuable, every piece of jewellery, every paise in the house disappeared and the bawarchi was no where to be found. Could he have cunningly waited for just such an opportunity to commit such a disgraceful crime Or could he be.